December 16th stands as one of the turning points in the calendar when changes to one's personality and coping mechanisms are needed in order for true authenticity to shine in beautiful ways. People born at this time tend to make things beautiful, often overdoing so and living their lives with pink goggles on, constantly looking for open doors in front of them, while failing to realize that their current circumstances aren’t as great as they might seem. The need for balance of giving and receiving is quite obvious in this planetary row, especially when we take into consideration the strong fiery Sun of those born on December 16th. They will be creative, inspired, and moving with the flow, typically good singers, dancers or musicians on a path towards grand goals and achieving more love and beauty in life. While this may be inspiring, there is a fine line between actual joy and their attempt to make their lives prettier when they don’t feel that good to begin with. Their coping mechanisms and defenses may include a lot of delusions and strange perspectives that make things in their life appear much more light and shiny than they actually are. Although they should never give up on their positive convictions and optimism, the core of their authentic Self needs to be found so they can truly attend to their personal needs. Their image of Self is to change in this lifetime, slowly sliding from imposed attitudes and opinions towards those that are felt deep within their heart. This inner process might be intense, overwhelming and sometimes dark, but no matter the loss or difficulty they are to face, they understand that there is light at the end of any tunnel in their life. "A Bluebird Perched on the Gate of a Cottage"
There is a fluffy, chubby imagery here, a bit less gracious than one might expect, but certainly joyous and filled with song, rhythm and gameplay. People born at this time need to test their limits, stay childlike and open for strange moves that might seem repetitive but teach them something new. 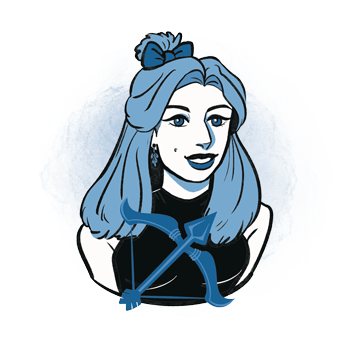 They want to experiment, be as noble and royal as a true Sagittarius while holding on to their inner, less serious nature. Humorous and fun, they should never give up on their true personality just because they are pushed by social norms and rules imposed by important figures, role models, and the outer world. 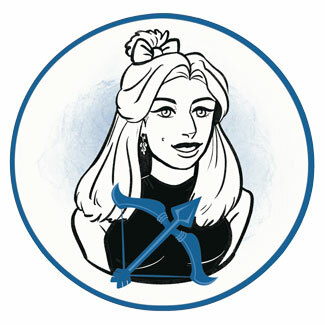 With the purpose in lives of those born on the 16th of December found in the gravity and light of their Sun in Sagittarius, it is obvious that they are to reach the core of their authentic personality without compromise and with full respect to their own needs, talents, and childlike creative force. Typically, they will require a lot of solitude, to separate from outer influences for a while, until they learn about things they truly need and create solid boundaries that will allow them to seek middle grounds and act from the point of everyone's best interest, starting with their own. With both Venus and the Moon in their planetary row, we can see that there is a clear emphasis on the partnerships, romance and love life of those born on December 16th. In search for their soulmate and the right person to be with, they could stumble upon too much strange beliefs, run from intimacy, or rush into it without a clear sense of the personality of the one standing in front of them. Projections are as typical here as in anyone else, but their idealism could push them over some lines that shouldn’t be crossed if they aren’t careful enough to never compromise over their own personality and self-respect. In need of love, they are to give just as much as they receive, and recognize emotional interactions that hide below the surface of the obvious and clearly seen. This might seem like torture for their open and lighted Sagittarian character, but the frailty of contact and the flow of emotion needs to be recognized in all its distant, shady, hazy qualities so they can truly show and accept their own vulnerability along the way. Someone born on the 16th of December does extremely well in all forms of artistic expression, public appearances, singing, playing instruments that are hard to learn, and are sometimes prone to show off with all their qualities. Their personality is colorful and fun, making them great comedians and those who bring beauty into the most challenging situations and places. Working well in large teams, they are party planners, organizers of fun events, clowns in a local hospital or workers in toy or cartoon production. Yellow topaz is the perfect stone for Sagittarius representatives born on December 16th, for it gives them the constant presence of faith in the process they are moving through. It is a crystal known to aid manifestation of one's visions and desires, helping with attracting qualities they carry in their heart so they don’t have to chase after their goals when they can be otherwise brought to life – with positive beliefs and faith. Attracting helpful people into one's workplace and home, it evokes new friendships and relationships with a greater purpose. People born on December 16th love public events, gala parties, concerts and places where they can dance, sing, and let go to the flow. They need free-spirited adventures and to feel loved, and you can never go wrong with a day in touch with the woods, out in the open, in a music festival or buying tickets for concerts of their favorite musicians. Buy a piece of jewelry that stands out, something fun and colorful rather than too elegant or modest, a perfume with a cheerful note and a small painting for their bedroom that will put a smile on their face. Laughter, positivity, and a fun personality ordain those born on December 16th for as long as they are in tune with their talents. Emotionally charged, they stay on the move, give love to be loved, and understand how to create balance when they find themselves falling into an extreme. Lost in confusion of relating with others, they absorb atmospheres, feelings and ultimately opinions of others, thinking that their personality is defined by what others see instead of feeling their own core of Self. In 1961 Bill Hicks was born, an American stand-up comedian, satirist and musician known for his controversial work and dark comedy. Since childhood, he has mocked his family's religious beliefs, telling his father to cherish his beliefs but not share them as if they were the truth. In 1963 Benjamin Bratt was born, an American actor recognized for his roles in Law & Order, Private Practice and Miss Congeniality. He is an activist for the American Indians and takes pride in his Indigenous American heritage. In 1981 Krysten Ritter was born, an American actress, model and musician, who starred as lead superhero on Marvel series Jessica Jones and appeared in Gilmore Girls, Veronica Mars and others. She promotes animal rights and posed for a number of PETA ad campaigns. 1843 – Octonions are discovered. 1937 – Two prisoners escape the prison on Alcatraz Island and they are never found. 1938 – A German decoration of state known as the Cross of Honor of the German Mother is instituted. 1947 – The first point-contact transistor is made. 1971 – Bahrain's independence is recognized by the UK and the date becomes Bahrain's National Day. 1979 – Libya, along with four other OPEC nations, raises crude oil prices and this dramatically effects the economy of the U. S.